CipherLab Presents 9700 Series Industrial Mobile Computer Craft for Superior Indoor Applications - CipherLab Co., Ltd.
Taipei, Taiwan - Aug. 15, 2014- CipherLab, a reputable innovator in the Automatic Identification and Data Capture (AIDC) is thrilled to share the amazing features of the 9700 series mobile computer. 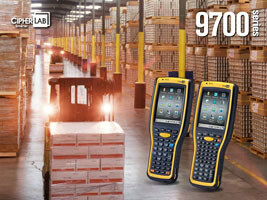 The 9700 series mobile computer uccessfully fuses industrial ruggedness, flexible versatility and comfortable design. CipherLab 9700 series' new features provide excellent reliability and adaptable modularity in harsh environments. "The 9700 series industrial mobile computer has all the features to produce in the warehousing and manufacturing verticals. Its data reading capabilities are specially made to excel within the four-wall environments. "We are really proud of the 9700 series' data collection capabilities in difficult environments. Our versatile reader options including 1D laser, 1D extended range laser, 2D imager, and near/far 2D imager are at your service. " Steven Liau, Chairman and President of CipherLab announced. "With a modular design for these readers, we confidently assure that the new 9700 series mobile computer could provide great advantages for your businesses."